Boisil teaching Cuthbert. Image: British Library. 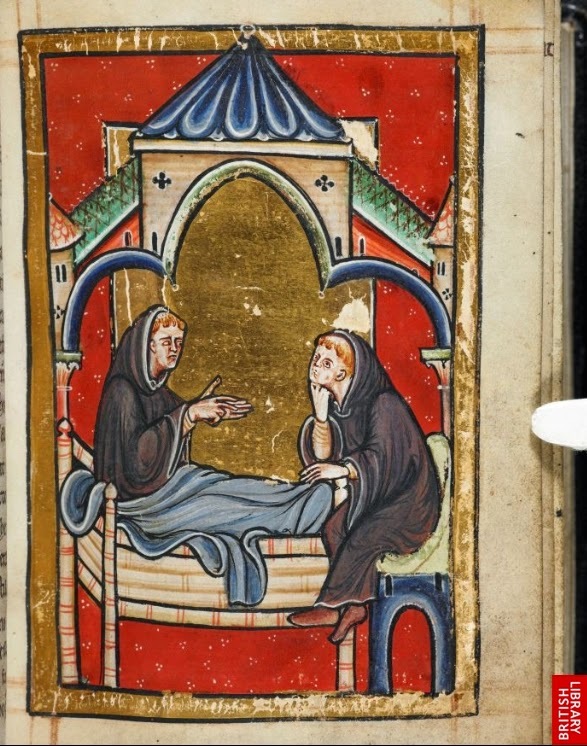 In the Life of St Cuthbert composed by Bede c 721, there is an episode in which Cuthbert asks his mentor, the saintly Boisil, to recommend a book that can be read in one week. Boisil suggests the Gospel of John, and provides a copy consisting of seven quires (codex habens quaterniones septem), which the two of them read together, one quire a day, until Boisil, as he has predicted, dies at the end of the seven days. Whether or not this story can be entirely accepted as historical fact is perhaps doubtful; it occurs in a text that is concerned more with promoting the saintliness of Cuthbert than with what we might consider historical accuracy, and I suspect that Bede wants us to see a parallel between the seven days of reading, after which Boisil goes to his eternal rest, and the biblical seven days of creation, at the end of which God rested. As well, we might wonder at Boisil’s recommendation of the Gospel of John as a book it would take a week to read; in a modern English translation this text is about the length of a longish short story, and a skilled modern reader could easily read through it in an hour or two. Each quire (quaternion) in Boisil’s manuscript would be the equivalent of 16 pages, but Boisil expected Cuthbert to take a day to read each quire. What is even more striking is that Bede considers a week’s time to be a quick read of the Gospel of John; he implies that ordinarily it would have taken longer. Medieval people must have been slow readers. Well, yes, by evidence such as this, medieval people were slow readers by our standards. But to discover why, we have to consider the evidence more carefully. London, British Library MS Harley 1775 (Harley Gospels), fol. 373v. John 1.14 per cola et commata, in scriptio continua. In 1997, Paul Saenger pulled off a feat I admire: he published a lengthy, detailed, and learned book entirely about the little spaces between words. Space Between Words is still the place to go for a painstaking account of the history of word separation in the medieval West, from the first texts separated by space in late 7th-century Ireland to the eventual adoption of canonical word separation for all Latin and vernacular texts in western Europe by the end of the Middle Ages. Although early Greek and Roman texts separated words by interpuncts (little dots), later Latin texts were written in scriptio continua (or scriptura continua): a continuous string of characters without spaces to mark word boundaries. Beginning in the late 7th century, Irish scribes introduced spaces at irregular intervals to create what Saenger calls ‘aerated’ text , and, by the 11th century, scribes in northern Europe were separating Latin text ‘canonically’ – that is, the way we do now in standard written English, with spaces between words. This history can be verified by checking the manuscripts that Saenger cites as examples, if anyone has the gumption to follow up all the items in Saenger’s impressive nineteen-page list. I, for one, am quite happy to take Saenger’s word for it. London, British Library MS Additional 89000 (St Cuthbert Gospel), fol. 1v. John 1.14 with canonical word separation. More controversial, however, is the argument that Saenger builds on top of this history, an argument encapsulated in the subtitle of the book: The Origins of Silent Reading. Briefly, Saenger claims that word separation was, in the Middle Ages, ‘the crucial element in the change to silent reading’. Silent reading, in turn, facilitated ‘reference reading’ – the technique of scanning texts quickly to find specific items of information – and contributed to the shift from the idea of reading as a public activity, as it was in the ancient world, to the idea of reading as a private activity, as it is in the modern world. I am, of course, greatly oversimplifying Saenger’s ideas here, but if you want all the details, you should read the book. Saenger’s thesis may be attractive, not least the argument that a seemingly innocuous and subtle encoding practice – introducing a bit of white space between words in written texts – has had such far-reaching technological and social effects. But is there a straightforward causal relationship between word separation and silent reading? I’m not so sure.